Hand crafted ornaments are a great gift. You can use them to decorate your Christmas tree, accent a gift package or just for hanging in a special place. They make great hostess gifts too. 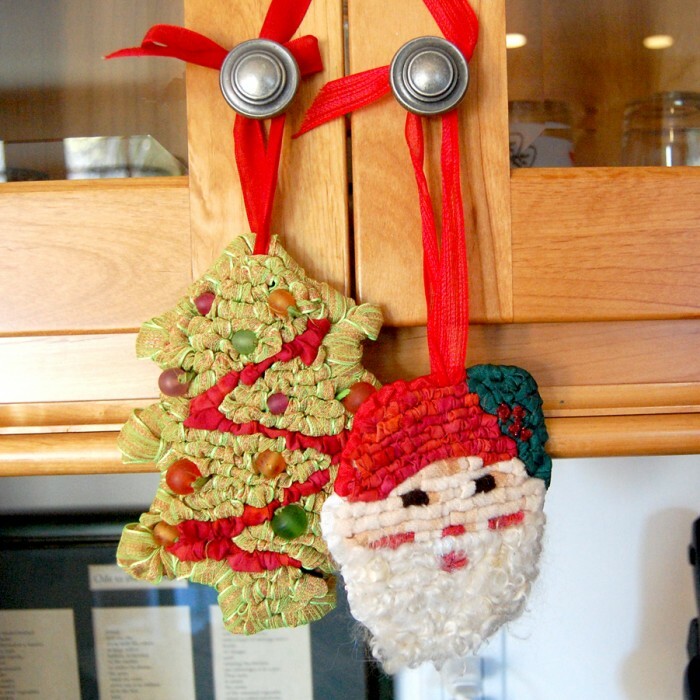 I love hanging them on the handles of cabinet doors to add some holiday cheer. Below are three designs: a Santa, a tree and a heart. The Santa Claus and Christmas tree are featured in the Locking Loops book. I made the heart earlier this year for Valentine’s day but it’s also a great ornament. 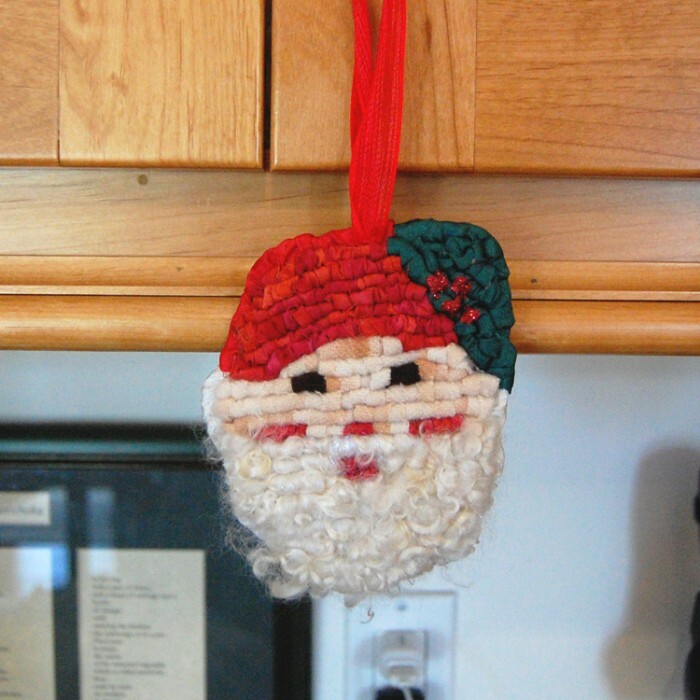 The Santa Claus ornament has a beard hooked out of unspun mohair locks to give it a wonderfully curly look. For instructions on how to locker hook an ornament in any shape, view the video tutorials part 1 and 2 at Color Crazy: How to Locker Hook an Ornament. All of these ornaments are locker hooked on 5-mesh canvas. 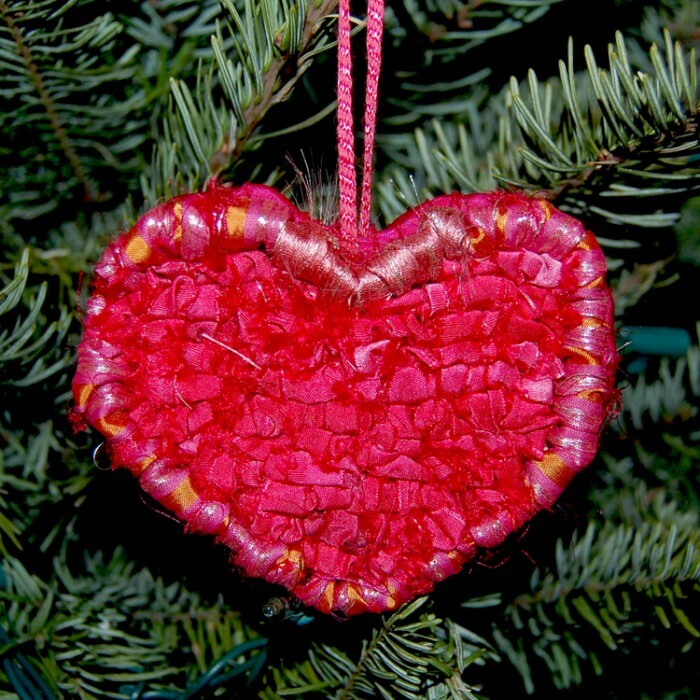 You can find a Locker Hooking kit for the tree at Color Crazy made from fabric strips. The tree above is hooked with ribbon. The heart below is locker hooked with Color Crazy Sari Ribbon strips in Winter Berries. Locker hooking the Santa Claus ornament was more involved because of the choice to use unspun mohair locks. It took a little extra time to get the beard hooked but it was so worth the effort. You can also substitute woolly yarn for both the face and the beard if you prefer. The pattern for the Santa can be found in the Locking Loops book. The post Top 10 Easy & Colorful Gift Ideas–#5 Ornaments appeared first on Color Crazy.